We’ve been given one mind with 100 billion brain cells. It performs 400 trillion processes every second, so it needs our help. These eight Fade-Fighting tips will help keep it sharp and humming along at its best. 1. Relationships with the People we “Do Life” with are gifts we give ourselves. They keep our minds healthy. Sharing hugs and fist bumps boost our brains and emotions. 2. Exercising Body and Brain Active muscles stimulate the brain and release healthy growth hormones. Brain chemicals or Neurotransmitter help us manage stress and mood. Our body generates natural feel good chemicals, endorphins, dopamine, and serotonin. Exercising our brains with crossword puzzles, Sudoku, or video brain training software help keep it sharp. Try Neurobics—switching up a regular activity by doing it with the other hand, or backwards, or finding a new way to do it. The brain loves novelty which creates new connections. Laughter can dissolve stress and heal our bodies, even without jokes. 8000 Laughter Yoga groups have formed around the world to enjoy its benefits. They fake laughing on purpose until the body takes over and makes it real. Knowing our world is in God’s hands frees our brain to fully experience the present moment and its gifts. Rest, knowing that fixing things isn’t your main job. Just be. Focusing on the positive counteracts the brain’s default mode looking for threats to keep us alive. Choose to be grateful and the entire body will benefit. The brain’s main job is to keep us alive, so its default mode is looking for threats. We can over-ride the negative focus and choose to be grateful and our entire body will be healthier and happier. Research shows the brain releases dopamine while expressing gratitude. It’s like enjoying a glass of wine without the chemical downside. 6. Creative Juices Go Ahead! Sing, Paint, Write! Your mind will love it! Always wanted to make something beautiful? Painting, drawing, or even coloring books exercise your creative juices. A bonus-they stay done unlike many of our daily chores. Music gives the brain a workout. Sing, dance, listen, or make your own music for a healthy “rush” and mental exercise. Writing either with a computer or with pen in hand is a great way to explore your thoughts. Let the “Night Crew” clear the clutter while you sleep. While our bodies are at rest, the brain’s glial cells are very busy getting rid of byproducts of converting our food to fuel. During sleep the brain gets a chance to sort information we’ve taken in throughout the day. It files away things that we’re motivated to keep and gets rid of things that aren’t connected to what we’ve used before. Note: Electronic screens before bed can interrupt the brain’s sleep cycle. The brain runs on a steady supply of fuel delivered by the blood. Since the brain is 80% water, we need to keep it hydrated. When the water supply gets low, headaches or fading function might show up. Healthy Omega 3-6-9 fats from fish, avocados, and oils keep the axon’s myelin wrap in good shape o brain cells can communicate with each other. Carbs become Glucose, feeding our brain. Choose healthy ones to keep everything working smoothly. Want more? 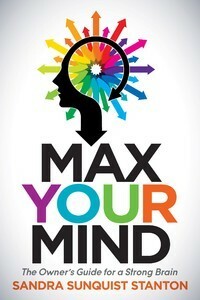 Order your personalized and signed copy of Max Your Mind: The Owner’s Guide for a Strong Brain from her website, Amazon.com or your favorite book store. Contact Sandra for Brain Coaching to help you create your own best life through applying everyday neuroscience. As your thinking partner, she can help you discover many more ways to be kind to your brain, giving it what it needs to stay healthy. 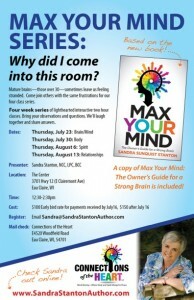 You’ll find information about booking a series of individual Brain Coaching sessions, conference presentations, or consultation tailored to your needs at www.SandraStantonAuthor.com. Why did I come into this room? If you’ve ever asked yourself this question, we’d like you to join us at the Center-Eau Claire for a combination book signing/brain chat on Sunday, July 19. Our four session class series will follow on Thursdays from 12:30-2:30 pm, beginning July 23 to Aug 13. We will laugh, learn and try out activities that have helped others “Fight the Fade” and “Bless the Boost”, celebrating the mental skills that improve with age. ! Register by emailing Sandra@SandraStantonAuthor.com. Your reply will include the address to send payment. Cost: $100 for Early Bird payments received by July 16. After that date, the cost will be $150.